Aromatherapy can also be called as a natural therapy. It includes the usage of medicine made out of plants. These medicines are generally in the form of essential oils. It is believed that aromatherapy boosts our mind. Moreover, it is credited to have uplifted the mood and health of the people. However, there is no scientific evidence to back up this theory. Although scientific methods failed to defend aromatherapy in the list of therapies that work as medicines, it still does have various health benefits. Aromatherapy uses tea tree oil, which is of anti-microbial nature. This nature of the tea tree oil helps in defeating various infections. As a fact, aromatherapy treatment is said to be one of the most effective home based treatment against skin infections like ringworm, rash, fungal infections, etc. Moreover, it also works wonder over wounds; especially cuts. Regardless of this information, aromatherapy has very limited evidence to validate itself as one of the major therapies. Aromatherapy includes the usage of various essential oils. These oils are extracted from various plants. Due to the lack of evidence in the favor of aromatherapy, practicing it is highly questioned by many. In addition, the major fact about the aromatherapy oils is that these oils are highly concentrated and can irritate skin when undiluted. It is therefore added with a bit of jojoba oil, coconut oil, etc. When combined with lime and/or lemon, these oils turn phototoxic. In addition, rigorous or long use of these oils can also cause irritation and/or infection. This may be caused due to the pesticides sprayed on the plants during cultivation. Aromatherapy oils are sensitizers and they are advised to use with utmost care. Therefore, it is recommended for the people to approach a certified aromatherapist. Aerial diffusion is basically dissemination or dispersal of the environmental fragrance in the surrounding. It is believed to be an aerial disinfector. In this process, the aroma is usually spread by using oil burner. However, one can also do it by using a boiling pot or a warm light bulb. Direct inhalation refers to the intake of the fragrance for various purposes. It works like a humidifier or steamer that helps in curing respiratory disinfections, nasal congestions, expectoration and a few other things as well. This aroma is believed to stimulate some functions of the brain as well. Topical application is the most common way to apply aromatherapy. It consists of various essential oils that are used to massage, compress and therapeutic skin care. These oils are also added in the bath to relax the muscular tension among people. Regardless of its natural nature, aromatherapy’s essential oils are required to use with utmost care after diluting them with other things/oils. Aromatherapists are the people who deal with various aromas, which are extracted from plants. With the aid of these oils, they try to assist people in dealing with their everyday physical and emotional need. We already know the two main function of aroma i.e. aromas stimulate brain functioning which releases estrogen (important factor in well-being) and it helps relaxing the muscles. Aromatherapy requires no such governmental or official certification. However, due to its risky nature, it is essential that a person should have proper aromatherapy education and training in this matter. 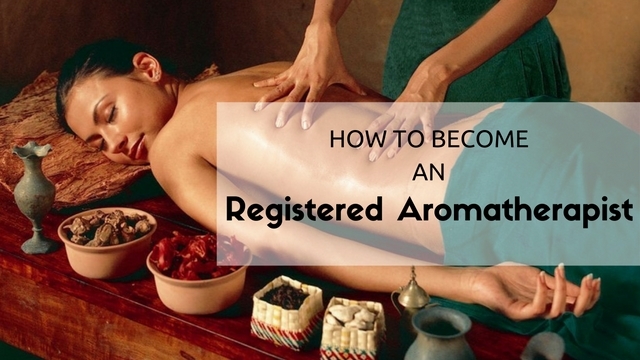 Because of it’s no such legal requirement, you can approach any aromatherapy school which certifies that you have completed your aromatherapy course properly. In addition, these schools make sure that their courses are convenient and accessible by the people. Therefore, these schools make sure to provide online, evening and/or weekend courses. This enables the working people as well as the school going students to start alternatively without much hassle or trouble. Not any school is authentically approved of running an aromatherapy training. Make sure to search for institutions that are accredited with NAHA i.e. National Association for Holistic Aromatherapy. This accreditation is based on whether the institution is minimally equipped to educate trainees according to the ethical standards of NAHA. We came to know earlier that schools have opted for aromatherapy courses online, evening and weekend courses. Well, the second step is to decide whether you would want go for an online course or and in-person one. Online course is typically ideal for people who have busy schedule or have to work. In such a case, in-person training seems a lot of work. However, one cannot deny the fact that learning in-person compared to online can give more scope of learning and understanding every aspect of the course. Moreover, if at all the students are met with any query then they can approach the instructor right away. Of course, it is not possible for everyone; hence, one could opt for online & in-person programs that are a combination of both the features. This will enable a person to not only learn through the distance course but also practice the course face-to-face. Timing is another factor that plays an important role. The first and foremost thing that you should do is to search for the required time that you would need to indulge. An NAHA accredited institution is said to indulge around 200 hours of training period. NAHA accredited certification is a level 2 certification and hence it is the highest level of available course certificate. Presently NAHA is trying to acquire certification for clinical aromatherapy. Examination is another factor that you need to check. NAHA accredited level two courses backed up with certain examination. As for the level one of NAHA, there is no examination for the basic of aromatherapy. However, level two is a bit complex and requires the candidate to appear for an exam. Level 2 (certification) brings along a list of targets that you need to complete, which are- research papers, case studies, studies on at least 25 essential oil profiles. Aromatherapy is a costly affair. Therefore, the cost of aromatherapy certification may be around $500 i.e. around 33000 INR. There are various options available that may help you lower down or cover the cost. However, you would need to build yourself a little by financial support to get through the learning session of aromatherapy. The nature of the course varies tremendously. The course may be same or even a bit more traditional than you might expect. Along with the regular teaching materials, this course may also provide seminars, lectures, and workshops by other experienced guest lecturers. As of being an in-person student, you would be highly benefitted by the traditional way of learning and will receive more exposure compared to that of an online trainee. Online training may not involve the exposure that is provided in in-person training. Therefore, make up your mind on what to choose carefully. Search, research and choose means that once you have decided on what exactly you wish to do, start searching for the institution of your choice. Try to search for an institution that provides you enough comfort and proper traditional training in both the cases depending upon your selection of the training. Research whether the institution requires you to buy the aromatherapy books and aromatherapy essential oils on your own or will be provided by them. Moreover, also make sure to approach the authority if any query persists in your mind. It is not a crime to investigate and understanding the place where you will be studying. Furthermore, it is you who is paying for the course; therefore, you have the right to see whether you would feel comfortable in the surrounding that is available or not. Learning is a very complex and complicated process. However, our education system is created to make it a bit simpler for the people. NAHA accredited institutions not only teaches you the basic but also things like the production of the high essential oils, basic structure and compositions of bodily processes, Manifestation of aromas with different emotional state, stimulation of each aroma on brain functioning, ethical and safety issue as per NAHA standards, etc. This is the basic NAHA curriculum; however, if at all you have queries or questions regarding something of aromatherapy (outside curriculum) then ask without hesitation. If your teacher is unable to provide satisfactory answer then internet is always available at your hands. Do not let you curiosity die in vain. Aromatherapy is known to be one of the most relaxing things or therapy. Hence, this increases the availability of hiring institutes around your area. Sectors or institutions such as spas, fitness centers, nursing homes and clinics, hospitals, yoga studios, etc. would definitely opt to hire an aromatherapist to increase the customer satisfaction and comfort. Having an aromatherapist on board is also an asset to the beauty parlors as well. Interesting opportunities are always at the doorstep. Thus, go out and search for the opportunities in the local newspapers, internet, etc. Entrepreneurs are all around the area nowadays. In such a time, thinking for your own center is actually a rewarding idea. You can switch to a firm which provides consultancy of aromatherapy, essential oils and its use to people. Along with consultancy you can also deal in selling essential oils or go for workshops and seminars to give necessary information and promote awareness in public about aromatherapy and its benefit. Massage therapy is another option where you can combine aromatherapy. Working as a massage therapist along with the knowledge of aromas can help in gaining satisfactory customers. Moreover, this satisfaction will definitely turn into mouth to mouth publicity and improve your customer base. So if you encounter a customer who is both stressed and tensed, you can apply the knowledge of aromatherapy and get better results. Aromatherapy can be used as holistic medicine. The job of an aromatherapist only includes consultancy as aromatherapist are not health care providers. They cannot diagnose any diseases; however, they can give consultancy on better use of essential oils to live a better lifestyle. That simply indicate that if at all a person suffers a problem, an aromatherapist can recommend certain steps but no medication. Aromatherapy is a non-medical profession therefore; it should be treated as mere consultancy firm and not a medical clinic. Moreover, make sure that your customers are aware of the nature of your job. Before making any recommendation, make sure to let them know that you are not a medical professional. Nursing homes, clinic, and hospice care are the best set of professions where you can combine your aromatherapy lessons to get better results. Nursing fields nowadays are encouraging this kind of additional courses too. If at all you are a nurse then incorporating both the skills can bet your patience more satisfaction. However, if you do not belong to medical field in any other way then you can get on board in any clinic as aromatherapist and treat specific problems. Aromatherapy is not a generalized profession. However, it is not a scam either. There are four such associations that make sure that the aromatherapy practitioners undergo specific training and complete the required course. The Educational Standards in Aromatherapy Association, The National Association for Holistic Aromatherapy (NAHA), The American Alliance of Aromatherapy, and Natural Oils Research Association (NORA). Being an aromatherapist not only requires you to complete the standard accredited certified course but also networking. Presently our world works on the pillar of networking. Join the network of aromatherapist’s community and expand the scope of your success using aromatherapy as your main subject.